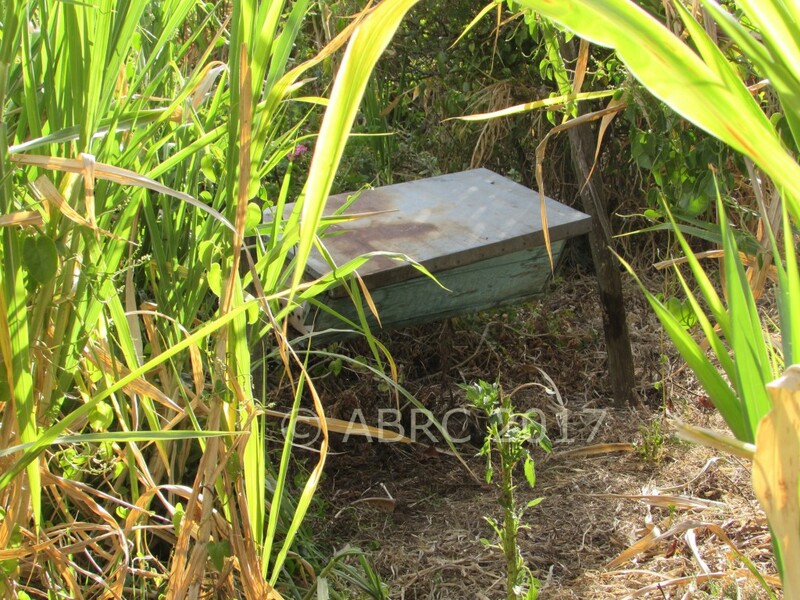 Nicodemus was identified as a very good committed beekeeper in the area by Baraka Agricultural College, Molo and the local Ministry of Agriculture staff. He was identified because of his passion for bees and beekeeping. He provides services to other beekeepers for a fee and is a local beekeeping researcher. We talked to Nicodemus at his home near Elburgon. In the 1970s he lived (and kept bees) in Kericho. He learned beekeeping from the Ndorobos (a tribe dwelling in the nearby Mau forest), from an old man called Chelogoi who worked on his bees together with his wife, Tobandi. Nicodemus came to Nakuru area in 1986 because of growing tribal tensions. He left his bees behind. He bought a shamba (small farm) in Elburgon. Nicodemus began a farmers’ group, called Chesa Group, in 1996 in the Cheponde-Saptet communities. He was selected as the chairman of the group and guided them towards beekeeping. He paid a carpenter to make top bar hives in 1996 after copying the design from Baraka Agricultural College. Nicodemus is not employed. Bees provide a large part of his income and he uses the sloping part of his land for his apiary. He started with nine hives and now has 24. 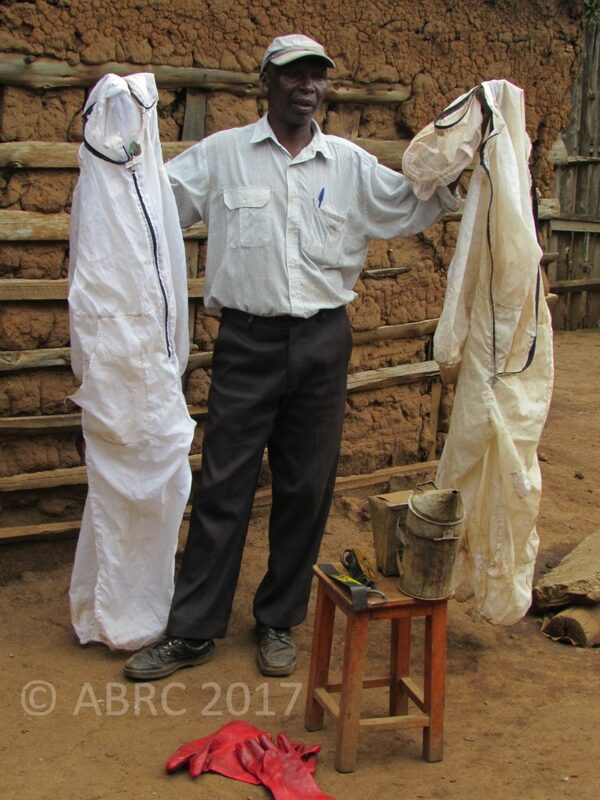 He has three different types: Kenya top bar hives, Tanzanian top bar hives and traditional hives. Eventually he aims to have 40 hives. He has fitted all his hives with queen excluders to ensure there is no pollen or brood in the honey; and to avoid mistakes if he falls ill and other beekeepers harvest honey for him. He promotes queen excluders to other beekeepers. Nicodemus usually has good hive occupation rates but only half of his hives were occupied when we visited him. (The other 12 were empty because of the exceptionally dry season.) He plants trees to provide a better environment for his bees, and produces and sells avocado and passion fruit seedlings from his own tree nursery. He produces and sells about 150kgs of honey each year. 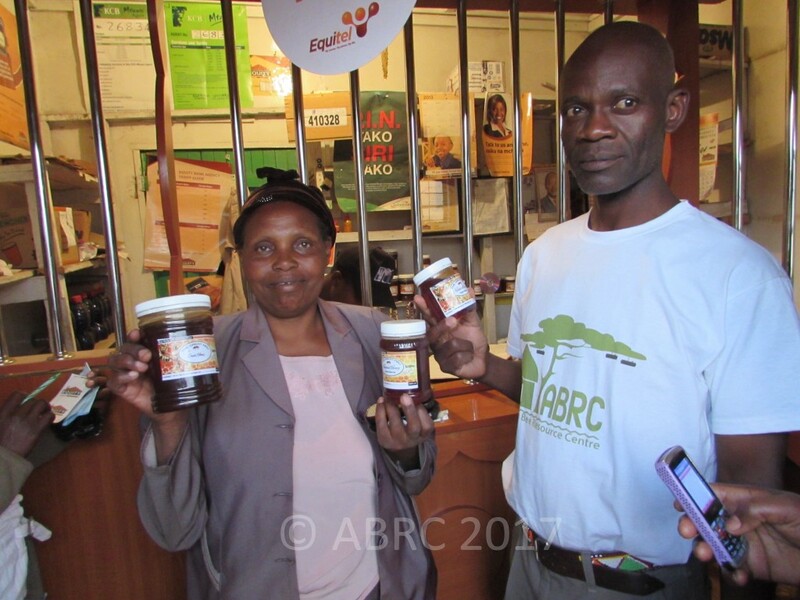 (One kilogram of honey sells for Ksh.400Ksh i.e. €3.6.) He sells to several outlets (including the Eel Hotel in Elburgon and individuals in Mombasa). If he runs out of honey he buys from other beekeepers, and from Baraka College. He saves his beeswax, and adds value to it by cleaning it and by making and selling body cream. He makes money from harvesting honey for others for a fee (Ksh.300 per hive). There is no charge if there is no honey. If a customer has no cash, he receives payment in honey (about 1.25kg). He harvests honey for about 30 people/bee groups each season, travelling as far as Kiambu, Laikipia, Rongai, Nakuru and Molo, with clients paying his transport costs. People get to know of him by word of mouth. He explained “I’m good at harvesting, and people ask for me because I only harvest the ripe honey at the right time in the right season”. He doesn’t harvest in the rain and doesn’t harvest honey that contains pollen. He collects bee colonies from walls of homes and roofs for a fee. He trades honey, buying local honey and selling it to others. Nicodemus has a bee suit, gloves and spare gloves, boots and a smoker. He wears a baseball hat under his veil so the peak keeps the bees away from his face. He says he has stopped using the smoker, except when training others. Nicodemus also has a set of scales for weighing honey, and uses plastic containers for harvesting and storing honey. There are three other people in the Chesa group who can harvest. Sometimes they work as a team, but the 15 other members still prefer Nicodemus. He can hold the torch as he harvests, so he is used to working by himself. He harvests when the honey is capped, in the evening when bees are calmer. Nicodemus doesn’t sell all of his honey after harvesting it so that he can spread out his income over the year. He also retains comb for himself. He doesn’t like the taste of honey but bites small pieces to give him strength during harvesting. 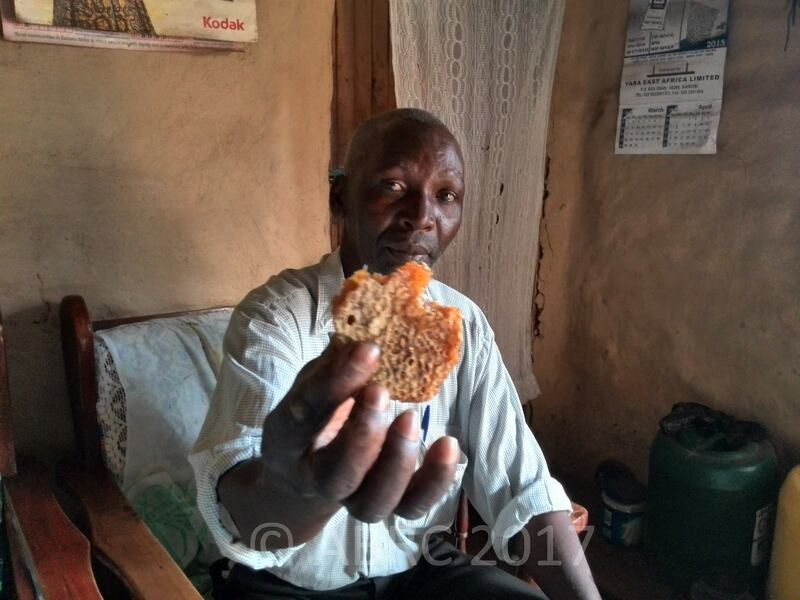 First, he takes a lot ugali (a stiff porridge made from maize meal), then takes small pieces of honeycomb. He calls it his energy food. Small ants are the most problematic pests in his area. 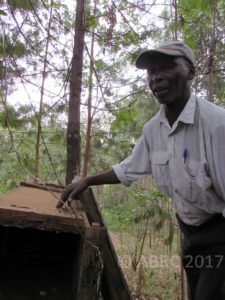 He uses cow dung to seal the top bar hives, and puts ash around the stands. Rats also like bee hives so he checks and cleans his hives regularly. He has specialised in beekeeping, and has gained a reputation as a “go to” person on bees and honey. He doesn’t fear bees; he “loves bees”. He is interested, committed, knowledgeable and confident in his beekeeping. Beekeeping (and being a farmer-trainer) has elevated his status in the community, and he is a role model. He treats beekeeping as a business. He makes money from beekeeping in many ways: from honey production and trading honey, to providing harvesting services and selling bee equipment. He adds value to beeswax. He conserves his local environment. He has planted a variety of trees on his farm, and has a nursery producing seedlings that are also good bee forage. He is a local bee researcher, experimenting and adopting new ideas. He uses queen excluders, tests different types of hives, and records production. Leah with her beehives at Mau Narok, Nakuru. 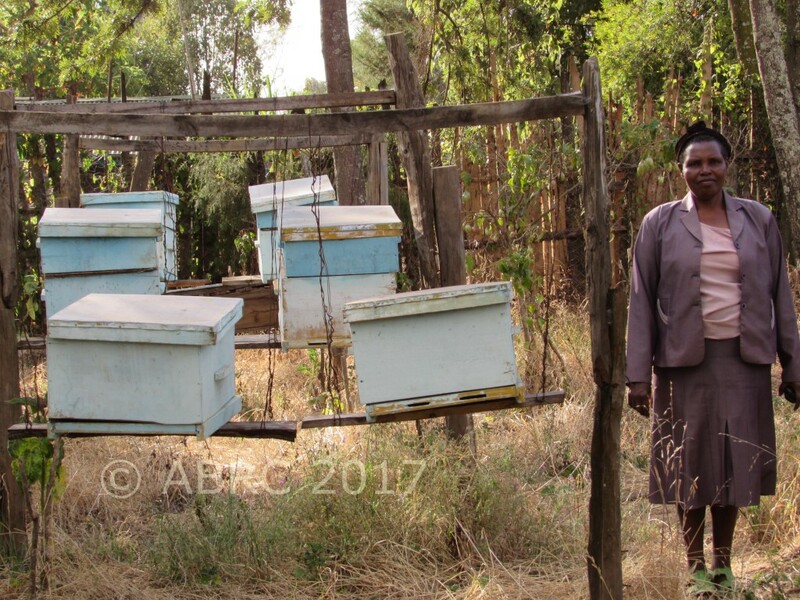 Leah was identified as a very good beekeeper by Philip Owiti, Beekeeping Officer, Nakuru County, because she is consistent, and addresses problems when she finds them. Leah started planting trees on her small farm for shelter. Then she started selling trees, and experimented with passion fruit (but they were struck by disease and did not do well). Later she decided to plant cut flowers, and when she saw bees coming to visit them she decided to keep bees as well. In 2006 she was trained in beekeeping at Baraka Agricultural College in Molo and received follow-up support from staff at the college. 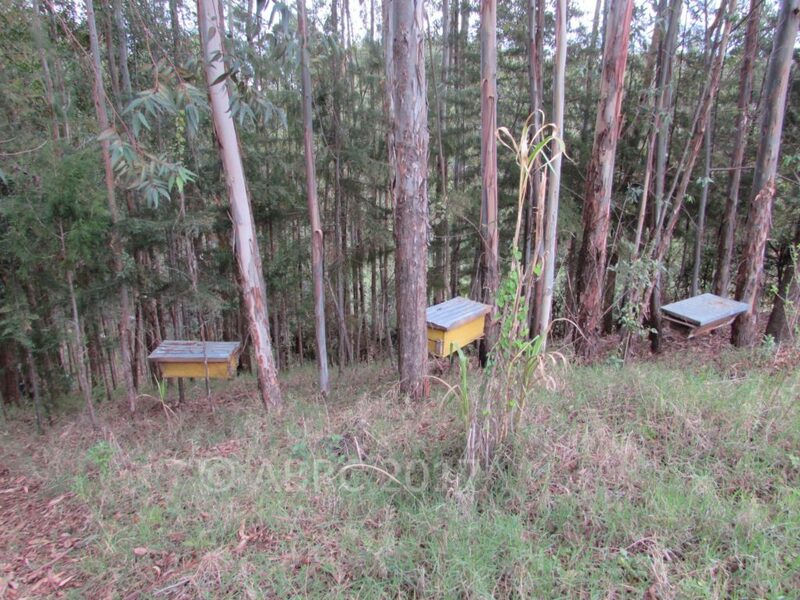 At the time of the interview Leah had Kenya top bar hives (KTBH) and Langstroth hives. She had no traditional beehives and said they did not do well. Of her 26 beehives 20 were occupied. She usually harvests about 20 hives and collects an average of 20 kg per hive/annum. Leah says the KTBH average is 20kg per hive, the Langstroth gives 10kg per hive and log hives yield 5kgs. She prefers the top bar hive. How beekeeping has helped her? From the proceeds of her beekeeping enterprise, she has bought one and a half acres of land. This is a major achievement given that it has nearly doubled the size of her farm. Place top bars correctly/make them correctly to avoid problems at harvest such as more than one comb per bar or the bees not attaching the comb to the top bars correctly. Leah is more than a beekeeper. She is an entrepreneur and finds many ways to make her business successful. She is a leader in her local beekeeping group. (The group has its own label for marketing honey, and encourages all their members to use it to improve marketing. It is called The Great Mau Honey. Honey is sold at the following prices: 250g for Ksh.200k, 500g sells for Ksh.300; and 1kg for Ksh.600k. Leah Kimani is also aware of local environmental issues. She has planted trees on her farm, and has been involved in efforts to conserve the natural forest near to her home. She is successful, and has bought land to expand her farm from the proceeds of her beekeeping.